Its snowing here again and we got around half a foot of the fluffy stuff today!! The trees look really pretty but he roads are another story altogether!! Back home in the early afternoon, I decided to get some cooking done and stock the refrigerator for the next few days - look like the chill is going to set in and by Friday the temperatures will be in the minus F numbers!! I began with making some fresh paneer (Indian Style Cottage Cheese), then chopped some apples for a crumble, soaked some soya nuggets for a curry, and finally set the pressure cooking off with chilka mung (split green mung beans) with Swiss Chard. Back to the paneer, and I decided to pair it with some palak (spinach), spices, and milk for a creamy Palak Paneer without the extra effort of pureeing the spinach. Yumm!! Heat the ghee in a pan. Add the cumin and asafoetida and allow to roast for a few seconds. Reduce heat, throw in the grated ginger, green chilies, and the spinach. Stir for a couple of minutes, then add a cup of water to this mix, and cook on low to medium heat for a 20 minutes or until the spinach is soft and the water has evaporated. Now add the milk and let the spinach simmer for another 10 minutes. Crumble the paneer and sprinkle it into the palak with the red chili powder, and garam masala. Blend the pameer into the palak, cook until all the milk has been absorbed. 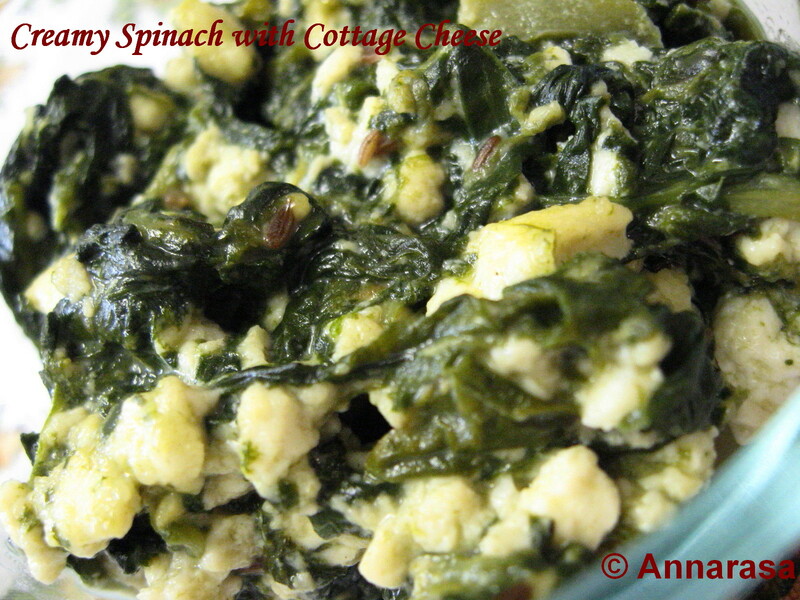 Season with salt and serve this creamy spinach-cottage cheese combination hot with rice or chappatis. Wow palak paneer looks extremely inviting..
Yum yum malai palak paneer, loved the recipe. lovely recipe...I think i will like it when made it this way....too good!